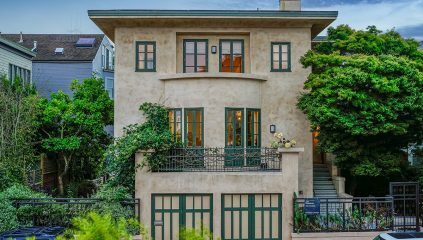 Perched atop of Ashbury Heights and over-looking majestic Buena Vista Park is 1581 Masonic Ave. A custom designed, detached home offering luxury living. As you step inside a grand entry foyer greets you. The spacious living room features a gas fire place with an ornate limestone and wood mantel. Numerous windows offer an abundance of natural light, making this room airy and inviting. The round dining space can accommodate many guests and offers an ideal entertainment space as it is directly off of the kitchen. A large center island, high end finishes and top notch appliances will draw you into this space making it the "heart" of the home. Access to the homes garden and guest bathroom finishes off the first floor. Upstairs is the master bedroom with private sitting deck, large bathroom with a steam shower and walk in closet. The second bedroom offers a great amount of space and separate sitting room. The second bathroom features a beautiful stone bathtub with shower over head. Located on the lower level of this home is the third and fourth bedrooms, split bathroom and family room which boasts a double sided fireplace that is shared with the outdoor dining space. Herringbone wood flooring, Sonos audio throughout, 2-car side-by-side garage and an upgraded radiant heating system complete this amazing home!